This week’s Simon Says Stamp Monday challenge is “Get In Shape”. I wish my project was based on getting my own body in shape, but that is not the case. I have been making shapely little houses though. How is this particular house appropriate for the “Get In Shape” challenge? Well, it is a very unique pattern, one which I did not design. 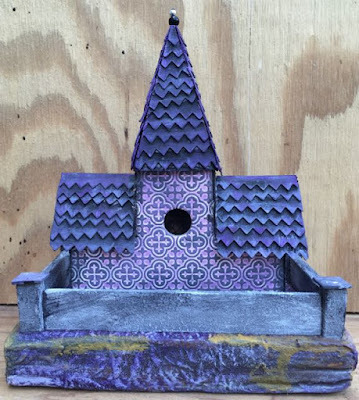 This design is from Howard Lamey, the best cardboard house maker. He graciously shares his patterns on the Cardboard Christmas forum. This design makes a tower without having to glue it on the roof. It is an integral part of the building. When I saw it, I thought to myself, that is a special design. A very special shape for a little house. Here is the house before I added the surrounding wall. The color is pretty accurate in this photo. The pattern is basically an inverted T with gable ends. 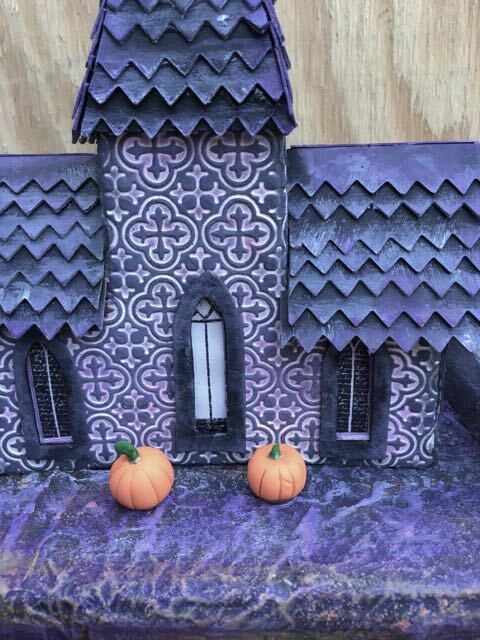 The side walls are flaps from the body of the T. I picked purple just to use a different color for my Halloween houses. I embossed watercolor paper with a Tim Holtz Texture fade called “Tiles” which I glued on the cardboard form of the house. Then I used my Distress Oxide Wilted Violet ink to color the tiles. I went over them with some Black Soot Distress Oxide ink for the spook factor. I really like the pattern. The windows were made from Dark Room Door window stamps on plain white paper, cut out and glued to the window openings. 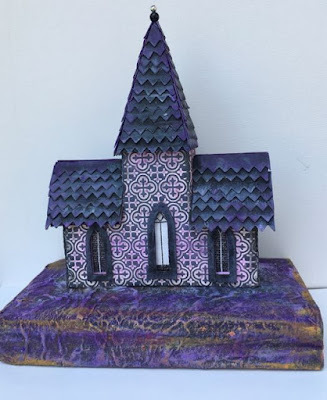 I used a Sizzix die Mini Scallop and Pinking to make the roof shingles. I edged the shingles with Picket Fence paint and then some Wilted Violet paint. Here’s the finished house – the Tower House. 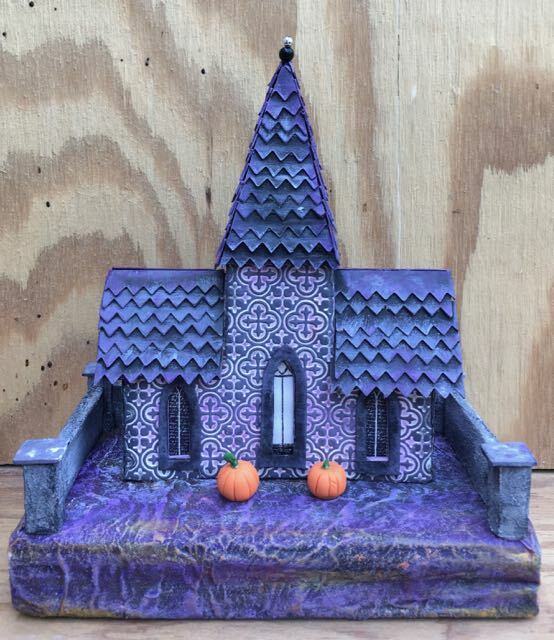 This color may be a little too purply in the photo, but in truth, the house is purple. Back of the house. I let the ochre paint drip off the edge of the base. I may clean that up a little bit. I kind of like drippy edges though. 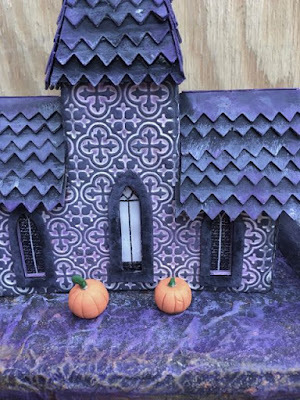 Close up view of the windows and the center door, also the polymer clay pumpkins which I put on almost all of my Halloween houses. Bird’s eye view of the front door. Well, that is my shapely house. If you’ve been here before you know I am making a bunch of houses to sell in October for a Habitat for Humanity. I’ve got a pretty good collection going. Thank you. The Cardboard Christmas forum has so much information on making the little houses. The Dolly Toy company was one of the US companies that made the houses. I think they started during WWII when Japan was obviously not making stuff to sell to the US. Thank you, Laney. I always appreciate hearing from you. Especially since you really know how to paint. How fun and what a fabulous cause too…yay you! 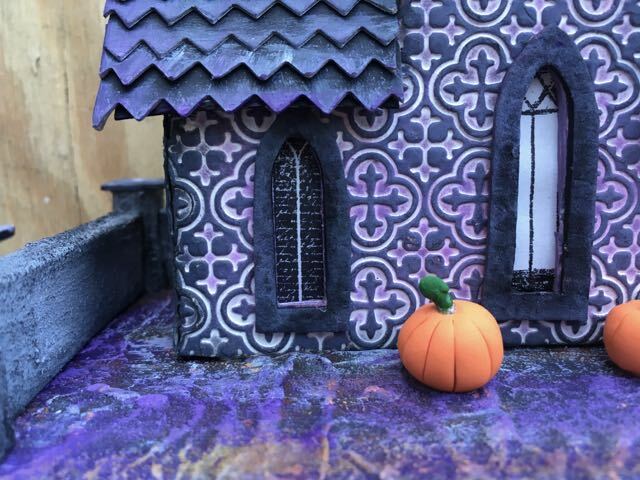 This is precious and festively fun…love the pumpkins and patterns. Thanks so much for visiting me too, and sorry I haven't been around. Anonymous, maybe if I delete your comments, you will quit getting the emails. So I will do that after you receive this comment, ok?